I have been working on the rigging of my new Trident 13 for four months now. I am finished and am going to start a series of post on what I did and how I did it. I plan on finishing with a monster overview post, showing all of my customization. This is the second post in the series. The first post on installing a fish finder can be found here. The Trident 13 has a space directly behind the seat that looks as if it is made for a Plano Dry Storage Box . 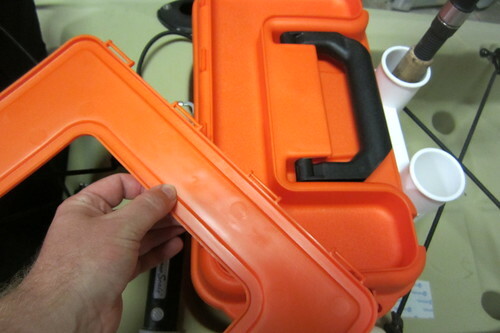 You know the ones I am talking about, the orange rectangular boxes used to store emergency boating supplies. After doing a little research I discovered that Ocean Kayak actually did create this space specifically to accommodate a Plano dry box. These boxes can be found everywhere. Even Walmart sells them! If you don't like the orange ones, look in the duck hunting section of your outdoors store. They are often sold in black and camo for hunters. It should be noted that they are dryish boxes. The keep most of the water out. Since my kayak is designed to use one of these boxes, I decided to trick one out and use it to carry all of the miscellaneous stuff that tends to clutter up my cockpit. The first thing I did was add rod holders. 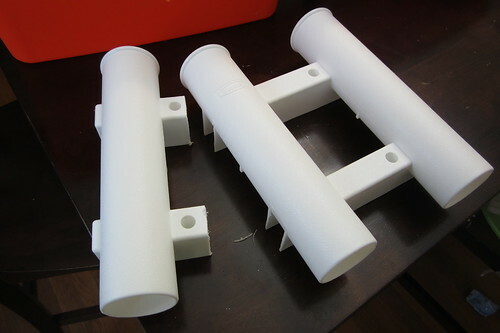 I could not find a set of three rod holders that would let the dry box slide into its compartment when attached. So, I cut one of the tubes off. Had I looked harder I would have found them at Hook1. 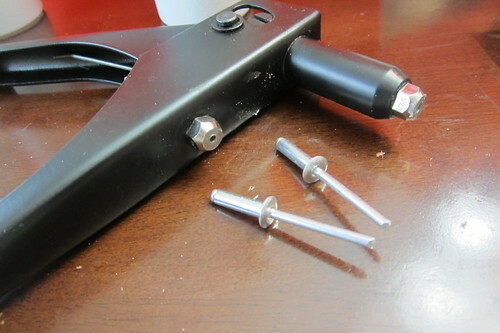 A rivet gun made attaching the tubes easy. Don't have a rivet gun? Buy one. When it comes to kayak customization, rivet guns are worth their weight in gold. The next thing I did was add a paddle clip to the front of the dry box. Because it is a convenient place to store my lip gripper. I can reach back without looking and grab it in a flash. 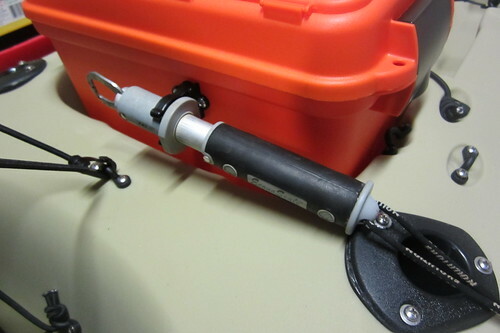 Every kayak fisherman knows that when you need your lip gripper, you need it NOW! Before I went any further, I tore off the top tray lid and tossed it. It just gets in the way. The open tray on top of the box is a convenient place to put that extra piece of bait or lure that you will need in a second. 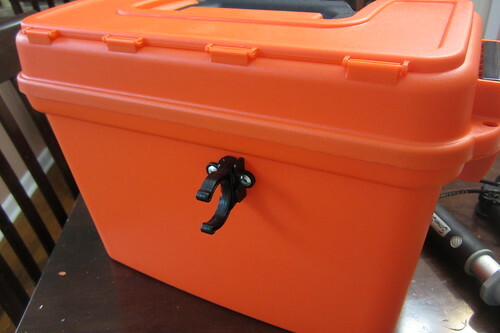 The Trident 13 comes with a bungee system that is used to keep the dry box in place. I do not like how it works and question how secure this method it is. So, I added pad eyes to the side of the box and used Nite Ize Gear Ties to hold it in place. These twist ties look flimsy, but are actually extremely strong. I can lift the kayak with one. They are one of my favorite ways to lash things down. I have used them to tie down my crate for a year now. They are easy to undo and I have never had one fail. This Plano dry box stays stuffed. In it I keep my drift sock, stringers, a waterproof box with a good first aid kit, wrist tape, a screw driver, a wad of zip ties and rubber bands, and my waterproof camera box. If I bring a snack or meal, it goes in this box. It is a nearly essential part of my kit. I purchased all of the pad eyes and the paddle holder from Hook1. They have the best prices. I should have purchased the rod holder from Hook1. They sell them individually. Had I done this I could have fit three, instead of two, on the box. If you decide to shop at Hook1, be sure to use coupon code UNLUCKYHUNTER for 10% off!